Have fun as you used to with the game of Cheecoting (seaside marbles). You shoot the marbles by simply touching the screen, make them dart along the straight, leap over the jumps and take the bends. Live again the sensational challenges of summers past, cradled in the palms of your hands. Now you can challenge your friends or the computer, or play solo to practice and improve your game. Choose a track and plunge into the fantastic 3D graphics. With sandcastles, drinks cans, lollipop sticks, pits, parabolic bends. It’s just like being on the beach. Ready? Steady. Go. Marble races on the sand! - 3 three ways to play, Multiplayer matches with as any as 4 players. - Choice of splendidly coloured marbles. - Choice of tracks with parabolic bends fast straights, obstacles, pits and jumps. - You shoot the marbles, choosing the direction and how hard or fast to shoot just by rubbing with your finger. - The rules are those of the Italian Beach Marbles game. 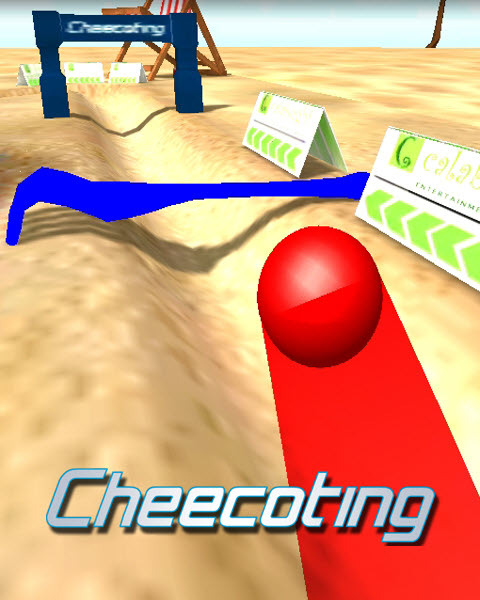 Cheecoting is available worldwide through the App Store and Google Play in the Games category. The game has been shown in the IGF 2013 and Unity Awards 2012. Cheecoting has been developed by our company and is published by Calabughi. Cheecoting, the mobile game published by Calabughi, is now available on Steam Greenlight! Please support with your suggestions and votes this fantastic game of the beach marbles. If the game will be accepted on Steam, will be released for PC and Mac. The beach marbles game has been released for Android and is now available on Google Play! Download now the best summer game for iOS: Cheecoting!